Suicune does not evolve/is not evolved into. X Es wandert beständig in der Welt herum, um verunreinigtes Wasser zu reinigen. Es zieht mit dem Nordwind. X Il parcourt le vaste monde pour purifier les eaux polluées. Il accompagne le vent du nord. X Recorre el mundo para purificar agua contaminada. Corre veloz con el viento del norte. X Corre per tutto il mondo per purificare l’acqua contaminata. Si allontana con i venti del nord. X 세계 곳곳을 뛰어다니며 오염된 물을 정화시킨다. 북풍과 함께 달려나간다. Y Man sagt, es sei die Wiedergeburt des Nordwindes. Es kann verschmutztes Wasser im Nu reinigen. Y Il serait la réincarnation du vent du nord. Il peut purifier instantanément les eaux polluées. Y Conocido como la reencarnación de los vientos del norte, puede purificar aguas turbias y sucias. Y Si dice che sia la reincarnazione dei venti nordici. Purifica all’istante l’acqua torbida e putrida. Y 순식간에 더럽고 탁한 물도 깨끗하게 하는 힘을 가졌다. 북풍이 다시 태어난 것이라고 한다. 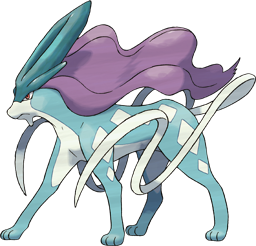 Omega Ruby Suicune embodies the compassion of a pure spring of water. It runs across the land with gracefulness. This Pokémon has the power to purify dirty water. Omega Ruby Suicune wohnt die Reinheit einer Quelle inne. Es läuft graziös herum und hat die Macht, schmutziges Wasser zu reinigen. Omega Ruby Suicune incarne la tranquillité d’une source d’eau pure. Il parcourt les plaines avec grâce. Ce Pokémon a le pouvoir de purifier l’eau. Omega Ruby Suicune emana la pureza de los manantiales. Suele corretear por el campo con gran elegancia. Este Pokémon tiene el poder de purificar el agua contaminada. Omega Ruby Suicune rappresenta la purezza delle sorgenti d’acqua dolce. Corre con grazia immerso nella natura. Questo Pokémon ha la facoltà di depurare le acque di scarico. Omega Ruby 솟아나는 물의 부드러움이 깃들어 있는 포켓몬이다. 흐르는 듯한 몸놀림으로 대지를 달려 탁해진 물을 맑게 하는 힘을 지녔다. 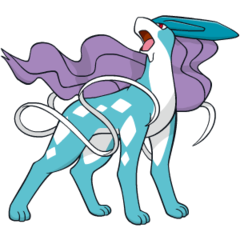 Alpha Sapphire Suicune embodies the compassion of a pure spring of water. It runs across the land with gracefulness. This Pokémon has the power to purify dirty water. Alpha Sapphire Suicune wohnt die Reinheit einer Quelle inne. Es bewegt sich graziös und hat die Macht, schmutziges Wasser zu reinigen. Alpha Sapphire Suicune incarne la tranquillité d’une source d’eau pure. Il parcourt les plaines avec grâce. Ce Pokémon a le pouvoir de purifier l’eau. Alpha Sapphire Suicune emana la pureza de los manantiales. Suele corretear por el campo con gran elegancia. Este Pokémon tiene el poder de purificar el agua contaminada. Alpha Sapphire Suicune rappresenta la purezza delle sorgenti d’acqua dolce. Corre con grazia immerso nella natura. Questo Pokémon ha la facoltà di depurare le acque di scarico. Alpha Sapphire 솟아나는 물의 부드러움이 깃들어 있는 포켓몬이다. 흐르는 듯한 몸놀림으로 대지를 달려 탁해진 물을 맑게 하는 힘을 지녔다. Gold Said to be the reincarnation of north winds, it can instantly purify filthy, murky water. Silver This Pokemon races across the land. It is said that north winds will somehow blow whenever it appears. Stadium2 Said to be the reincarnation of north winds, it can instantly purify filthy, murky water. Ruby Suicune embodies the compassion of a pure spring of water. It runs across the land with gracefulness. This Pokemon has the power to purify dirty water. Sapphire SUICUNE embodies the compassion of a pure spring of water. It runs across the land with gracefulness. This POKeMON has the power to purify dirty water. Emerald SUICUNE embodies the compassion of a pure spring of water. It runs across the land with gliding elegance. It has the power to purify dirty water. Diamond It races around the world to purify fouled water. It dashes away with the north wind. Pearl It races around the world to purify fouled water. It dashes away with the north wind. Platinum It races around the world to purify fouled water. It dashes away with the north wind. SoulSilver This Pokémon races across the land. It is said that north winds will somehow blow whenever it appears. Black It races around the world to purify fouled water. It dashes away with the north wind. White It races around the world to purify fouled water. It dashes away with the north wind. White 2 It races around the world to purify fouled water. It dashes away with the north wind.